Welcome to Canyon Connection's Forums! This service has been established to provide our readers an opportunity to share information and their interests about Kern River Valley; Kern River; Lake Isabella; Sequoia National Forest. Community Forums are open to all interested participants. 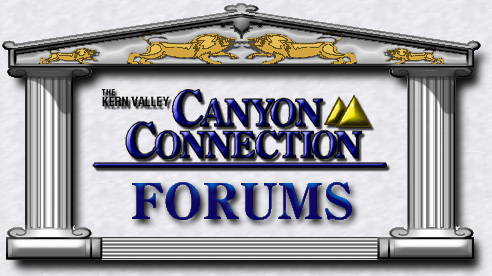 As such, personal views or statements expressed within this medium are not necessarily the views or opinions of Canyon Connection; kernvalley.com; it's publisher; advertisers; sponsors; or individual forum monitors. Unfortunately, public forums sometimes attract those that feel anything goes and anything can be said. Be aware at all times that U.S. laws regarding Freedom of Speech does not provide protection from litigation in matters involving libel, defamation of character, or malicious intent postings. Readers of all ages view our pages and the Canyon Connection will not condone off-color language or content, in any form. Forums are not intended or created to provide free advertising, please refrain from using any internet forum to do so. Every effort will be pursued to identify and eliminate abusers of this community service. Thank you for your consideration in this matter. Enjoy!